I had not heard of this evening's guest conductor, David Robertson before. A young Californian, he seems to be an up-and-comer. He has very sharp, square, rapid movements that look rather painful. It appears as if every motion of his body would plot out as a square wave if you were to graph it. The concert opened with John Adams's Naive and Sentimental Music (1998-99). Due to parking difficulties, we missed the first movement, but the remaining two were quite enjoyable. "Naive and Sentimental" do not have their normal meanings in this context. They are a reference to a 1795 essay by Schiller, contrasting "Naive" poetry that springs from the heart and a wish to say something, with "Sentimentalische" poetry that is self-consciously created by a soi-disant "artist" as part of his metier. This was followed by the Prokofiev First Violin Concerto, with Cho-Liang Lin. Didn't knock my socks off. The pièce de résistance was the Janácek Sinfonietta, a long time favorite of mine. George had played in a couple of movements of this with his school Concert Band, and, consequently, we had obtained an extra ticket so we could bring him along too. The symphony was played by a very small ensemble, 16 instruments if I'm not mistaken. It was a bit thin and rocky. The Mass, however was very fine indeed, they have an excellent chorus. I had found the original Austin Powers, International Man of Mystery mildly amusing. I heard that this one was better, but, like Rick in Casablanca, "I was misinformed." What a piece of puerile dreck! Second snow day in a row. Spent the day working on the Harris web site. Wow! Like everybody, I've seen this parodied a zillion times by everybody from the Muppet Babies to The Simpsons; I knew Marlon Brando wore an undershirt and yelled "Stellaaaa!" and that Blanche du Bois "had always relied on the kindness of strangers"--but I'd never actually seen the play nor the movie. I repeat Wow! This is a startlingly great film, featuring most of the original Broadway cast and the original director, Elia Kazan. This is the first of the Honor Harrington series , a space opera based quite closely on C. S. Forester's Horatio Hornblower series, with a female protagonist. If you're as fond of "hard" science fiction as I am, and also as much of a Hornblower fan as I am, you'll like this. This is part of Baen Books' "Free Library" program, wherein they make some volumes available for free download, in hope that you'll get hooked and either buy other books in hard copy or use their pay download system. It worked for me, I've already signed up and downloaded 4 other novels for ten bucks! Woody Allen as a disgruntled worker ant in this computer-animation feature. Great fun, highly recommended. One of my fans sent me this charming little book, in a 1969 reissue, edited by Daniel Ford. It describes a pleasure voyage taken in the halcyon summer of 1858, from Boston to Provincetown, then down the coast to Bar Harbor. The author, along with 3 friends whom he calls "The Artist," "The Assyrian," and "The Professor," charters the 33 foot sloop yacht Helen of Swampscott. The owner and a colleague, "The Skipper" and "The Pilot" are part of the deal. They all have a grand old time fishing, drinking, fishing, smoking cigars, fishing, playing practical jokes on one another and fishing. The book is full of lovely descriptions of the coast and its inhabitants. There's also rather more detail about the fishing than I would have liked, not being a seafood fan. All in all, though it was a delightful diversion. This FOX production stars Gerard Depardieu as Jean Valjean and John Malkovich as Javert. Depardieu has become a bit too old and fat to play this role, but did a pretty good job considering. John Malkovich was very badly miscast as Javert, who he played with a languid detachment entirely inappropriate for the role. In addition, everybody else in the film had a real or assumed French accent, which caused Malkovivch's anglo-american accent to stand out in sharp relief. All in all, this was a much more worthwhile effort than the execrable Billie August/Liam Neeson/Clare Danes production, though that horrible botch is not hard to improve upon. Considering the difficulty of distilling a 1500 page book into 3 hours with commercial interruptions, they did a pretty decent job. This production did include the meeting of Valjean and Cossette in the forest, but, unfortunately, they rendered it rather prosaically. Lola Montez was a Spanish dancer and courtesan, involved most notably with Franz List and Ludwig I of Bavaria. This excellent and lavish film recaps her scandalous career in the framework of flashbacks from what has become a circus act based on her reminiscences. Peter Ustinov is super as the Ringmaster. Liszt has the most amazing 4 horse travelling coach, more like a moderen motor home than anything else. Even has a "continental" spare wagon wheel on the back of the enormous thing. This was one of the first Cinemascope films, and no expense was spared in staging it. It is amusing, though, to see the crude shadow masking Ophüls uses in lieu of a zoom lens. Presumably, zooms were not available for the Cinemascope format at the time. A light comedy starring Richard Gere and Julia Roberts. A pleasant, highly predictable diversion, nothing great. Features a cameo by Sela Ward, of my current favorite TV show, Once and Again. Two college kids from Brooklyn get charged with robbery murder in a small-town Alabama convenience store. One of them has a cousin (Joe Pesci) who's just passed the bar exam after 6 tries. Cousin Vinny comes down in his beat up Caddy with his unemployed hairdresser fiancée, and great culture shock ensues (though the race card is never played.) This film is a lot of fun, definitely recommended as a light comedy. This was Howells's debut as a novelist, a charming story of a newlywed couple's wedding trip in the hot summer of 1870. From Boston, they took a train to New York City, then an elegant steamboat up the Hudson to Albany, railroad again out to Buffalo, Rochester and Niagara Falls, then a slightly less elegant steamboat down the St. Lawrence to Montréal and Québec, and back to Boston by rail. Since I've been to many of the places described, it was fascinating to read the descriptions of how they were 130 years ago. Howells had a wonderful descriptive style. Parts of the book are very amusing, others lyrical, others philosophical. It's a varied and healthy literary diet. Howells is a transitional writer, moving from the romantic to the realistic aesthetic, and there's a lot of what must, at the time, seemed humdrum quotidian reality in this book, but time has given the age an exoticism that it wouldn't have had for his contemporaries. I enjoyed this book quite a lot, particularly New York City in the horsecar age, the steamboat journey up the Hudson, Rochester, and the sojourn in Québec City. As one would expect of a Boston brahmin of the era, there's a certain amount of racism, and rather more anti-Catholicism and anti-Irish comment, though it takes the form more of padronism than hostility. Howells rather likes the Habitants, but, again, in a rather patronizing way. He rhapsodizes about the aptitude and solicitude of Black waiters, in contrast to the "severe native or patronizing Irish" waiters of Boston. The eleventh, final chapter finds our couple revisiting Niagara, this time with their 11 year old son and 9 year old daughter. This time they go across Massachusetts and through the new Hoosac tunnel through the Berkshires, one of the wonders of the age. They find Niagara much the same physically, but very different in their middle-aged reaction to it. This is a very fine piece of work, highly recommended. Living in the suburbs with four licensed drivers sharing a single car has become to much of a juggle, so we've bought a second car to take up the slack. 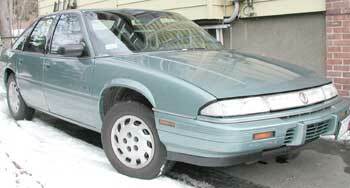 It's a '93 Pontiac Grand Prix, 150k, but in pretty nice shape for $2500. The '97 Chrysler Town & Country minivan will remain our primary car. My brother and his wife were in town, and dropped over bearing wine and cheese and conversation. It's always a treat to see them. This is part of the BBC/Time-Life complete Shakespeare series. I'd seen this on TV years back during the first run, and enjoyed it very much. Since then I've seen what Kenneth Branagh can do with a Shakespeare comedy, so my standards have been raised somewhat, but this is still great fun, and Roger Daltrey is quite good in both of his roles. Being a Turkophile, it's surprising that I've waited so long to see this grim film. In 1970 Istanbul a young, extremely dumb American tourist tries to smuggle some hash home with him, but he is caught. At the time, the Nixon administration was giving Turkey a lot of heat about heroin, so catching an American citizen in a drug "offense" was a good opportunity for the Turks to make a point and to get a bit of their own back. "Billy Hayes" (Brad Davis) falls into the clutches of the Turkish prison system (if it can be called a "system.") He makes a bad situation worse by a series of boneheaded blunders. He is tortured and abused, winds up spending 5 years incarcerated under medieval conditions before killing a guard and escaping. In addition to being grim and depressing, this film also suffers from poor writing and implausible dialogue. Not recommended. An entertaining farce, with Robert De Nero as the crazed ex-CIA father of the bride. Went to the Museum of Our National Heritage to see the exhibit The Bicycle Takes Off. Lots of really neat stuff from the boneshaker era. Also, Mark Twain's Columbia Expert high-wheeler. Arlene, Chris, Russ, Nick & Lucy came over, we had a nice meal together, though Arlene was under the weather with some flu-like malady. All week, the internet connection at the shop was down. I was sick Monday and Tuesday, only went in for a couple of hours each day, couldn't face dealing with the problem. Today (Wednesday) I'm feeling a bit better, and really need to be able to do email at the shop, so I checked out the connection with a telephone, yep, that's OK. Called up Apple service, spent quite a bit of time checking various settings for the AirPort...then...d'oh! I remembered that as of the first of the month, we now have 10 digit dialing! I had not set the AirPort to dial the area code for the local call to Earthlink! Duh! Andre Norton is not my favorite science fiction writer, but she's well up on the list for light entertainment. I probably should have read Time Traders first, rather than starting with this sequel. Nevertheless, it's a good read. It is actually two related novellas, The Defiant Agents and Key Out of Time. The basic premise involves time travel to the distant past (perhaps 10,000 years ago) and finding a crashed starship of a then powerful starfaring race, defunct in our time. Earthfolk reverse engineer their starship, go back to the "present" and begin to explore the universe, using navigation tapes salvaged from the derelict. There's also a Cold War element, seems rather quaint now. The Defiant Agents has both Soviet and American colonists on the planet Topaz. To improve their chances of survival, both groups have been selected for their racial background and been subject to treatments intended to "revert" them to take advantage of "racial memory" and make them more fit to survive the primitive conditions on Topaz. The Soviet group are Mongols, the American group are Apaches. Recommended to fans of classic science fiction, but it would probably be better to start with Time Traders. Went in to the dentist for a routine checkup...mirable dictu, all is well, just got a cleaning and told to come back in 6 months. Last time I was at the library there were pretty slim pickings on the DVD shelves, I grabbed this remembering it to be "fair-to-good" the last time I saw it, on VHS. Big surprise, seeing it on DVD on the new Wega tv, in gorgeous widescreen. Quite a magnificent visual treat, as well as some great Lerner and Lowe songs and lots of great dancing (choreography by Gene Kelly.) Van Johnson was great as cynical boozy Jeff. Highly recommended, one of the great MGM musicals. I saw this classic in an art house many, many years ago. Watching it on DVD was enlightening. We actually watched it twice, first with the dubbed English, then with the original soundtrack, subtitles and spoken commentary by film historian Peter Cowie. The dubbed version was rather disappointing--although the visual element was, of course, excellent, the dubbing actors were not worthy of the challenge. Much of what was most impressive about this film in days of yore has to do with technical effects that no longer seem spectacular, given subsequent improvements in film-making technology. Despite that, Bergman's brilliant use of light and posing/framing genius come through. Since my own philosophical/religious opinions are pretty much in line with those of the skeptical squire, and I didn't have as oppressive a religious indoctrination in my youth as Bergman did, I don't really resonate emotionally with the knight's spiritual crisis. Thus, my appreciation of this film is more as a technical achievement than anything else. It's been a week since the mid-air collision between a U.S. E3 monitoring plane and a Chinese fighter jet, and there's still no sign of a solution to the diplomatic brouhaha. Bush is understandably reluctant to admit fault, especially since there is no actual evidence that the U.S. pilot was at fault. The E3 is never mentioned without the adjective "lumbering" and one would presume that the Chinese jet fighter would not be all that stable at a speed about half its normal cruising speed. The Chinese spinmeisters maintain that the E3 pilot made a sudden turn or bank causing one of the props to chop up the tail of the fighter. I find it hard to believe that our pilot would do such a thing on purpose, but I don't find it hard to believe that the jet's wash could have reduced the lift on the wing of the E3, causing an unexpected bank. This has been one of my favorite G & S shows ever since I had the opportunity to play King Paramount in the M.I.T. G & S. Players' production...but this is the first time I've ever seen Utopia from the audience. It was a good production, but not as good as the M.I.T. version. They had quite a good Scaphio and Phantis, but unfortunately they chose to cut the entire sub-plot about their rivalry for Princess Zara. This meant cutting most of the funniest parts of the show, and also the whole business of how they express themselves by dancing--which leads up to the scene when King Paramount does his own dance of defiance to them. "Hard" science fiction about the building of a "beanstalk" elevator to geosynchronous orbit. The best examination of the technological aspects of this concept that I've yet seen. Pretty good, if hard SF is your thing, as it is mine. A very pleasant romantic comedy. "Sitzprobe", the first rehearsal of Grand Duke with the orchestra and cast together. It went pretty well. I'd have been invisible behind the bass player even if I hadn't gotten up to take the photo. Put up a page about the War of the Rebellion, which I imagine will be somewhat controversial. George had his final Board of Review, and is now an Eagle Scout! Congratulations! Harriet and I are visiting my childhood home, 14 Kinglsland Road, North Tarrytown, New York. The house has changed a bit, but at the moment it is vacant and we are able to sleep over. The current occupants are a couple with two children and a frail mother of one of the couple. The living room has been converted into a bedroom for the mother, so she won't need to climb the stairs. The fireplace is covered up by the end of her queen-size waterbed. The front door is no longer used, and the former vestibule has been incorporated into this room. We stay in what had been my brother's room, which is a bit shabby at the moment. The harsh light of the single overhead fixture casts the peeling paint on the ceiling into sharp relief. What had been my father's study and ham shack is now, mysteriously, an empty room with white padded walls, and a similar, padded passage leading to the rest of the house. The master bedroom is a bit bigger than I recall, and is full of tacky, gaudy furniture. The only TV in the house is a black and white floor model with a fairly small screen, in a very solidly made Empire style wooden cabinet. Put-in for The Grand Duke. I'm not feeling too well, but managed to make myself useful up on the rolling scaffolding, putting my lashing skills to work to secure the pipe that will hold the sky sheet for the set. The Ursula K. LeGuin novel this is based on is one of my favorites. This made-for-PBS film is one that I'd seen when it was first broadcast, and it made a favorable impression at the time. Looking at it again, I'm not so charitable. In addition to the primitive and overdone special effects, the acting is mostly quite wooden, especially the extras who appear totally purposeless. I'd be inclined to blame this on the directors. George is 18! He has decided on Brandeis. We got him a very nice Yamaha euphonium for the occasion, thanks to eBay. March 4, 2001 Newton North High School Chorus and Orchestra Haydn: Missa in Tempore Belli; Symphony #49 "La Passione"